At Swinside shortly before 5am on 15th June 2003, I reached the summit of my 24th Marilyn within 24 hours (Marilyns are hills with at least 150m ascent on all sides), and became the first (and only) person to have climbed 24 Marilyns in 24 hours entirely on foot. I completed the run in 23:49:40, after 71 miles and 29,000 feet of ascent. 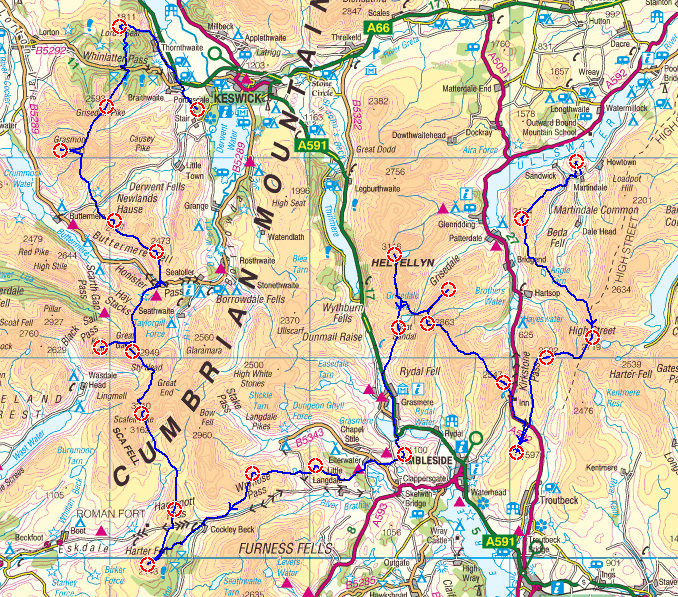 The route is about 5 or 6 miles longer than the Bob Graham Round, with slightly more climbing. A write up of my experience is in TAC59. From Helvellyn until Hard Knott it was far too warm. It wasn't until I was heading up Scafell Pike that I finally got some shade. The worst problems were blistered feet, getting frazzled in the sun, and getting lost in the dark in Whinlatter Forest near the end. At Elterwater, Blea Tarn and Cockley Beck I hadn't planned to stop for so long, but at the time it was my only opportunity to get out of the sun for a few minutes. My support on the day were Micky and Claire Ross, and it was Micky Ross who introduced me to the idea of Marilyns in the first place by showing me Alan Dawson's book The Relative Hills of Britain. There are plenty of runners capable of repeating this route, and there are several options to extend the route to 25 or 26 Marilyns for a stronger runner. 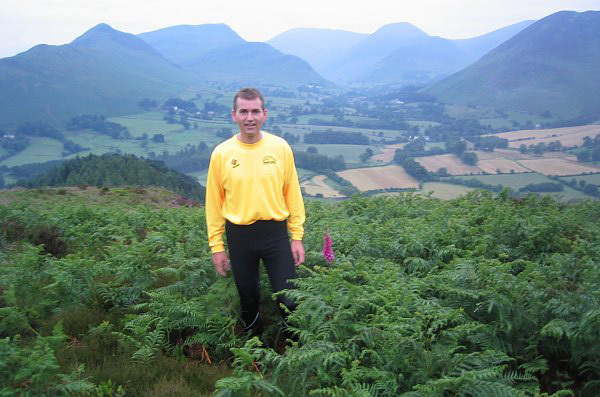 The best 25th hill would probably be to add Pillar after Kirk Fell before heading to Honister. To do 26, you could either add Pillar and High Stile, or possibly miss out Swinside and finish with Watch Hill and Binsey instead. This route won the FRA Long Distance Award in 2003. For anyone planning on repeating the route, this was my schedule.